Attention all lovers of small-sided football: here’s a film you’re going to want to watch. It’s a superb documentary released in November 2016 looking at the street football culture in France. It’s of huge importance because France is arguably one of the most vibrant, strongest street football hubs in the world. Top professional players like Riyad Mahrez, Ben Arfa and Zidane have come through the gritty production-line of French street football. Zidane is even reported to have said “everything I have achieved in football is due to playing football in the streets with my friends”. The film doesn’t feature the great man, but Mahrez is prominent throughout it – talking in-depth about his street footballing education. 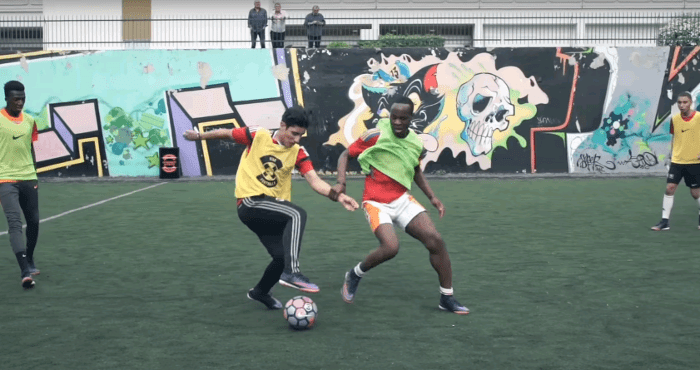 It’s not only him: current pro players Yacine Brahimi, Ousmane Dembélé and Serge Aurier also provide insights into the melting pot that revolves around the culture on the courts where players play out anything from 1-on-1 matches up to 5-a-side, even beyond. Mahrez features heavily, talking about how street football made him the player he is today. It’s a rare look into the sort of vibrant footballing community that many places over the world have. And the thing that comes across is that there are people there from all cultures and backgrounds, many of them with wildly different aspirations: some play with dreams of going pro; others just play for fun. But aside from the clear message that the furnace of street football is one capable of crafting the most incredible football skills, another point is noticeable. Whatever the colour, religion, or background of a player, when he’s on the court he stands equal with the next man. Not many games can completely transcend these lines. But football is clearly one of them. In essence, that’s the great thing the film captures: the joy, the enthusiasm, the camaraderie, and the sheer escapism from the weights of daily life that the game is capable of administering. Small-sided football, or street soccer, is rarely captured like this and it’s a joy to watch. The whole experience is beautifully summed up and the film is well worth a watch. Give the film a try, it might just remind you why you love the game so much.